With Republicans around the country loudly calling for restrictions on immigrants from Syria, Jeb Bush on Thursday cautioned against the dangers of xenophobia, even invoking the specter of Japanese prison camps during World War II. 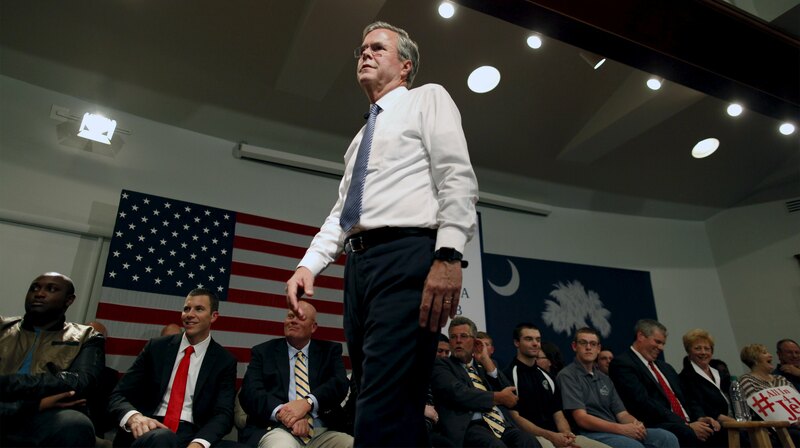 "I think we need to be careful about not trampling over the values that are important in our country," Bush told a town hall in Londonderry, New Hampshire. "I think it's appropriate to pause and get a better sense of how you go about screening, if its not satisfactory don't do it. Err on the side of caution given this Islamic terrorist threat," the Republican said. "But my god I mean we've had history where we've had to.... we've felt bad afterwards, internment camps and things like that. I think we need to be cautious as we go through this not to get to a point where our emotions overtake our brain. There ought to be a balance." Bush was responding to Michael Walsh, a 13-year-old Londonderry native, who asked Bush if the U.S. was going to "stop all Islams" from coming into the country. Bush gently corrected his language to "Muslims." Walsh told CBS News that he had biked to the town hall from his house in order to ask Bush about Syrian refugees because news coverage of the terror attacks last week in Paris had scared him. After taking a photo with the Florida governor, Bush handed him his business card. Walsh told CBS News that he was satisfied with Bush's response to his question. Bush repeated calls throughout his day on the campaign trail in New Hampshire for "a thorough screen process" for Syrian immigrants but "first a pause." "The administration ought to tell us exactly how they are going about this" Bush said. "And if we are satisfied or our elected officials are satisfied and we're satisfied that there's a thorough process then we should take a limited number of refugees." Bush emerged as a voice of pragmatism in the emerging debate over Syrian immigrants. Several Republican governors have said they refuse to let Syrian immigrants into their state in the wake of the terror attacks in Paris, warning that some refugees may try to sneak into the country to inflict harm on Americans. In Iowa, Republican frontrunner Donald Trump told NBC News that he would "certainly implement" a database to track Muslims in the U.S. Earlier in the day, Ben Carson compared protecting Americans from Islamic terrorists to protecting children from a "rabid dog."